Quad Cities-style pies, and taco pizzas, that are worthy of a detour. : Chicago isn’t left wanting for styles of pizza, from its quintessential deep-dish and stuffed to wafer-thin tavern-style and Neapolitans topped with artisanal ingredients. 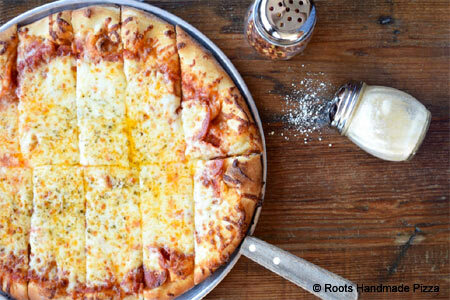 As such, Roots---which specializes in hand-tossed, Quad Cities-style pies---fills a niche. It comes from Greg Mohr and Scott Weiner (The Fifty/50), and they’re the first to bring the distinct malted crust varietal, which is sauce-light, cut into long strips and preferably topped with house-ground sausage, to the city. Your best bet, though, is the signature taco pizza, a tasty, Quad Cities classic, topped generously with seasoned, crumbled sausage, cheddar and mozzarella cheeses, tomatoes, shredded lettuce and taco chips with sour cream. You’ll also be smitten with the option-loaded, design-your-own salads, house-fashioned root beer and Chicago-style sandwiches. Tap liquor and the craft beer selection stand out as well.